The times are urgent, God is on the move, now is the moment to...ask God to ignite his fire in your soul! Pastor Jim Cymbala believes that Jesus wants to renew his people--to call us back from spiritual dead ends, apathy, and lukewarm religion. Cymbala knows the difference firsthand. Twenty-five years ago, his own church, the Brooklyn Tabernacle, was a struggling congregation of twenty. Then they began to pray...God began to move...street-hardened lives by the hundreds were changed by the love of Christ...and today they are eight thousand strong. 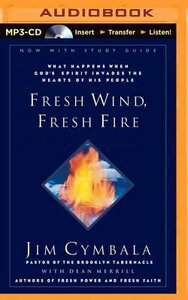 About "Fresh Wind, Fresh Fire (Unabridged Mp3)"
Customer Reviews For "Fresh Wind, Fresh Fire (Unabridged Mp3)"